Top of the mornin’ to you! 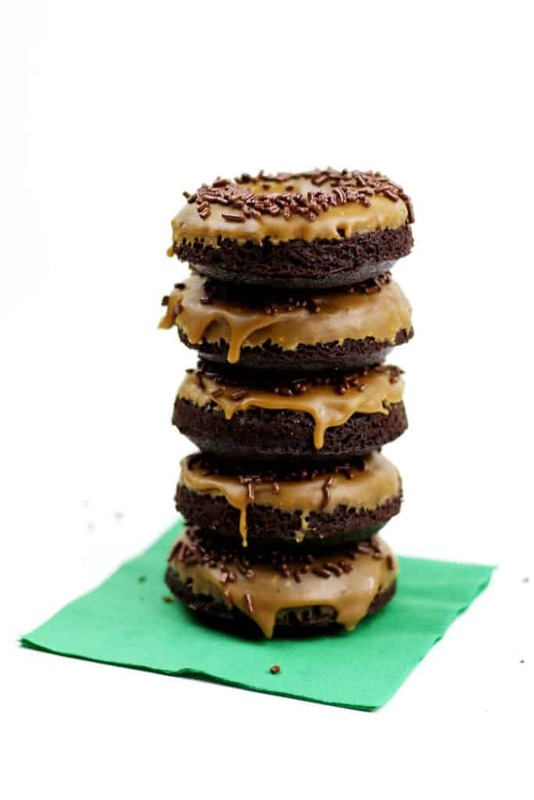 Don’t celebrate St. Patrick’s Day without a dozen of these rich, flavorful Baked Chocolate Guinness Donuts with Irish Coffee Glaze. Lovely day for a Guinness! Moving last month forced me to go through all my stuff. Going through some of my things felt like Christmas all over again. For example, I found some boxes in the basement that needed going through. I found some clothes in my closet I forgot I had. There were even a few surprises stuffed in the back of kitchen cabinets. I used to use this baby a lot when I first got it. 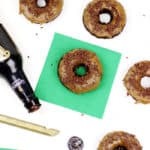 Remember these Baked Cinnamon Sugar Donuts and these Baked Birthday Cake Donuts? SO GOOD. It’s been entirely too long since I brought it out for some weekend baking. I love that St. Patrick’s Day is on a weekend this year. I’m not a huge fan of this holiday, but it’s always more fun to celebrate things on the weekend, because you can celebrate them all day long. 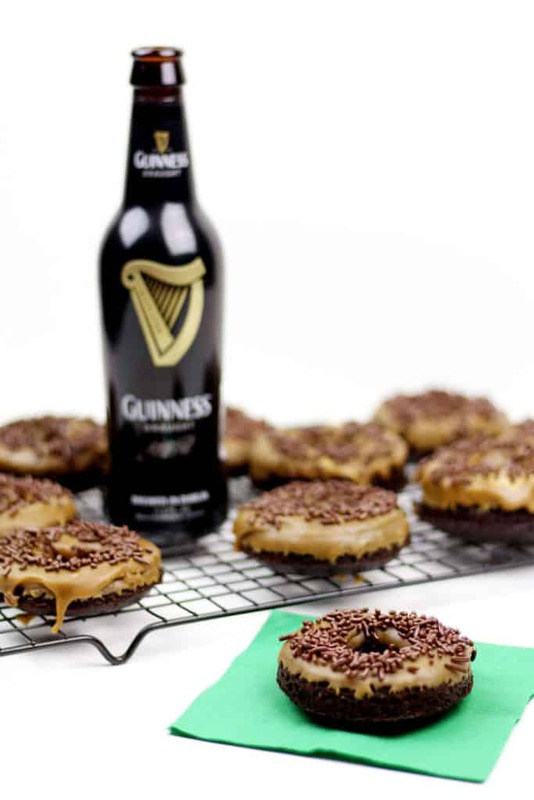 Drinking Guinness and Jameson all weekend isn’t the best idea, but these Baked Chocolate Guinness Donuts? They have beer in them! And the Irish Coffee Glaze? 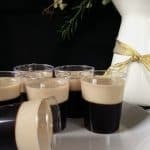 It’s flavored with espresso and sweet Bailey’s Irish Cream. And topped with lots of chocolate sprinkles. 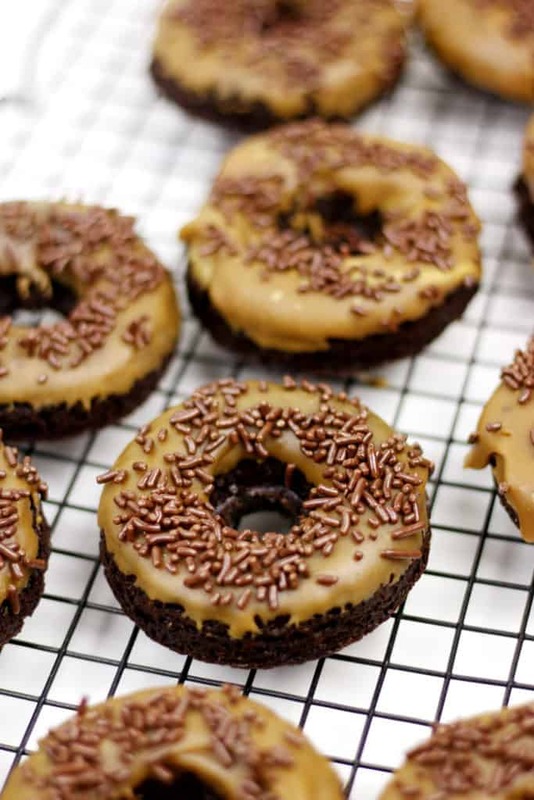 These donuts are rich and decadent. Each bite takes me back to a family trip to Ireland when I tasted my first Guinness. (I was old enough to drink in Ireland!) The verdict: I thought it was vile and awful. Now, I enjoy a good stout from time to time! My taste for beer has definitely developed since then. 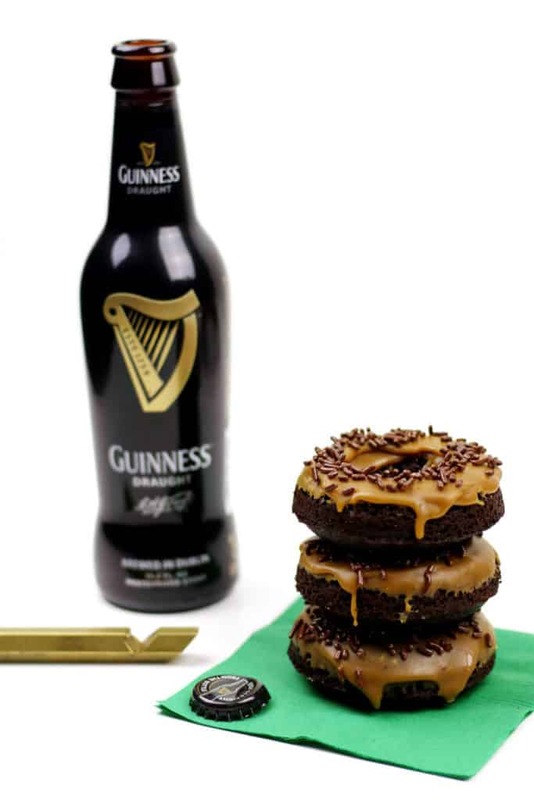 I will say: These donuts don’t taste exactly like Guinness. They do taste quite chocolatey, but the beer ads a richness and fluffiness that just adds to the chocolate. The glaze is my favorite part though. It has only four ingredients and tastes like magic. I made it over the stove and dipped each donut in it and quickly topped each one with sprinkles. Beware: This glaze hardens fast, so you’ve got to be quick! So worth it, though. I hope you make them this weekend! P.S. 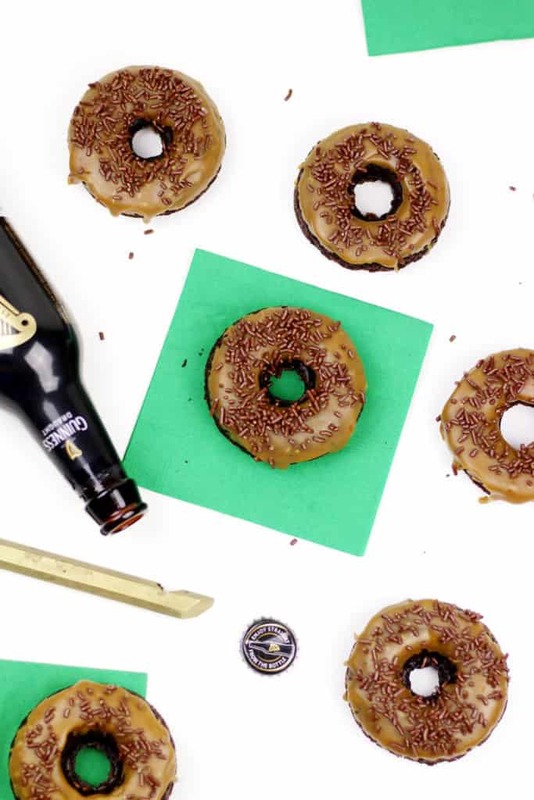 Want more St. Patrick’s Day party treats? 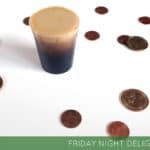 Try these Baby Guinness Irish Coffee Jell-O Shot, this Black Velvet Cocktail or this 2-Ingredient Beermosa! Preheat oven to 350°F. Prepare 2 donut pans (12 wells total) with non-stick cooking spray. In a large mixing bowl, whisk together flour, sugar, cocoa powders, baking soda and salt. In a small mixing bowl, stir together beer, oil, vinegar and vanilla extract. Pour beer mixture over the flour mixture. Whisk until combined and smooth. Divide the batter evenly among the 12 donut wells. Tap the pans gently on your work surface to dislodge any bubbles. Bake 15 minutes, or until a toothpick inserted comes out with a few crumbs. Cool in the pans on wire racks for 10 minutes. Unmold the donuts to cool completely on the wire racks. In a medium saucepan, stir together the confectioner’s sugar and espresso powder. 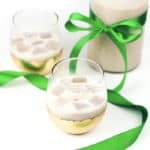 Top with Bailey’s and water and whisk together. Whisking often, cook the mixture over medium heat until it liquefies. It should be very smooth and warm, but not hot. Do not simmer. Use immediately. 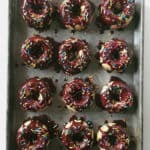 Reduce heat to low and dip the top-side of each donut in the glaze. Place donut right-side-up on a cooling rack. Immediately top with chocolate sprinkles before the glaze hardens. Just. Stop. It! I can’t even with these donuts…. I am literally drooling/crying that I don’t have any. Send me a dozen pretty please! 15 minutes was too long in my oven but 12 was perfect. Great idea! Thank you! Hey Carol! So glad they turned out for you. Oven times always vary depending on the household and location, so it’s always a good idea to keep an eye on your baked goods when you are trying a new recipe. 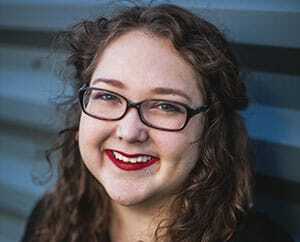 Thanks so much for stopping by to leave a comment!